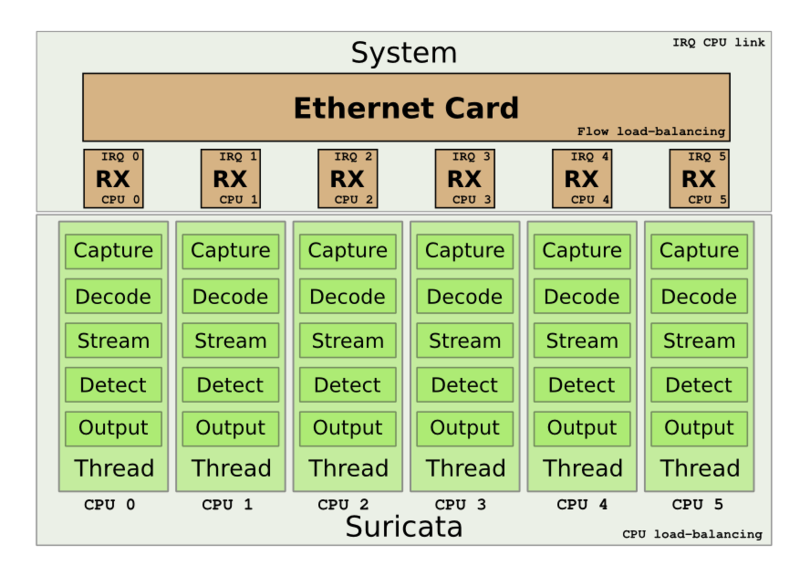 Suricata, to 10Gbps and beyond – To Linux and beyond ! Does the max-pending-packets setting really affect performance here? In workers mode the number of packets simultatiously processed should be the same as the number of threads, plus a few for tunnel decoding and stream handling. You’re right indeed. I don’t remember seeing any difference here. Was there a reason you chose AF_PACKET over PF_RING? Would PF_RING give you better performance? How many concurrent TCP sessions is this suricata.yaml successfully tested on? Could you please provide information on What was the HOME_NET set to? What % of input traffic hit the inspect rules ? We can not provide the HOME_NET information as it was a public address range corresponding to the public networks we were monitoring. We’ve got most of the traffic coming from this network. I’ve successfully implemented this configuration on a similar server. Everything works fine except the file extraction feature, nothing is ever stored to disk. Enabling the json log shows files are being tracked successfully. Could the zero-copy mode be interfering with file acquisition? Hello Coop, please send a mail to https://lists.openinfosecfoundation.org/mailman/listinfo/oisf-users with all possible information so community will be able to diagnose and understand this.